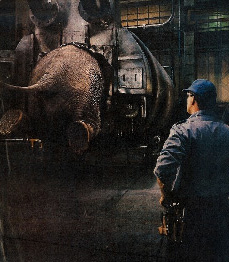 Remove the energy-eating elephant from your old boiler. Big old dinosaurs cost so much to operate. We will replace with smaller or multiple boilers to save you energy costs (dollars). Let us write you a "free" energy calculation and show you your energy savings today. We will write specs for re-designing and building and then you can compare apples to apples and see for yourself. We will beat most prices and leave with a clean and safer environment. Survey the rest, and then hire the best – Funk Boiler Works Inc. Anyone can call Funk Boiler Works Inc. any time of day or any day of the year to schedule a service appointment. Our service technicians are trained to fix all major boiler brands, and are available seven days a week to perform emergency maintenance. Schedule your customized Energy Efficiency Analysis today to find out how we can make your boiler needs less costly for your company. We always service what we sell. We often inherit customers when other installers (including competitors) are unable to follow up with service requests. Q: Should I cover my outdoor boiler system in the winter? Q: How often should I have maintenance done on my boiler? A: Boilers run better when they receive annual maintenance. Maintenance should be done in the spring, and will help your unit last longer. A customized Energy Efficient Analysis will determine your needs and the savings we can help you achieve. Q: What boiler maintenance can I do myself? 1) Check the air filter or coil every 3 – 4 weeks. A dirty filter will strain your system. For more information regarding boiler repairs, please contact one of our maintenance associates.